Makes: around a Cup of Coconut Lemon Chutney. Heat oil in a pan, add red chile and fry till they turn crisp and remove them onto a bowl. In the remaining oil, add all the other ingredients. Once mustard seeds start spluttering, remove from heat. Using a pestle, first thoroughly crush the red chiles. Then add the other fried ingredients and crush them lightly. Add the scraped coconut and salt and use the pestle to pound everything. Remove the coconut chutney onto a bowl, stir in lemon juice. Store tight in a refrigerator and it stays fresh for around a week. 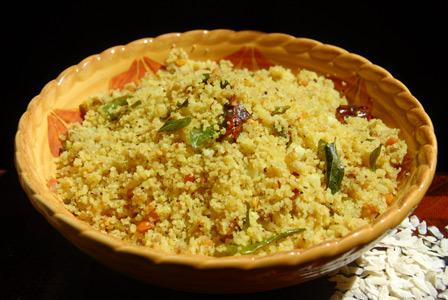 Notes: Make sure to grind the coconut chutney if using grated coconut. Suggestions: Adjust lemon juice according to taste. Variations: Check other variations with coconut chutney here and here. Other Names: Coconut Lemon Chutney, Kobbari Nimmakaya Pachadi. Fresh ginger is mashed and boiled in water with tea powder and peppercorns. 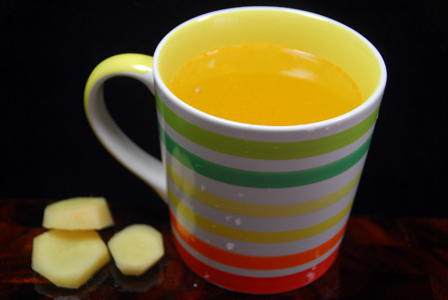 Serve lemony ginger tea immediately. Makes: One Serving of Lemony Ginger Tea. Heat around a cup of water in a sauce pot, add tea powder, crushed peppercorns and mashed ginger. Boil for around a minute, strain into a cup. Stir in lemon juice and honey to the tea. 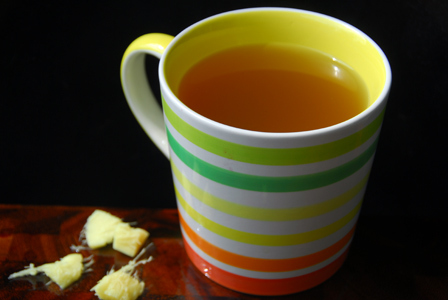 Serve lemony ginger tea immediately. Notes: Make sure not to adjust tea powder according to your preference. Suggestions: You can also use green tea instead. Variations: Add sugar instead of honey if you wish. Other Names: Lemony Ginger Tea. 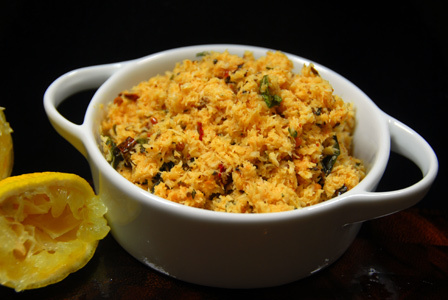 Poha / Flattened rice is ground into coarse powder. It is soaked with few splashes of water and mixed with fried spices and dals. Serve lemony powdered poha with yogurt. Makes: around 2 Servings of Lemony Powdered Poha. Wash, remove stems and slice the green chiles. Grind flattened rice / poha into coarse powder. Wash the powdered poha with water and keep aside. Leftover water will eventually be soaked by powdered poha. Heat oil in a pan, add peanuts and roast them until light golden brown. Remove the peanuts onto a bowl, add all other talimpu ingredients in order in the same pan with remaining oil. When chana dal turns light brown, add sliced green chillies. Fry for a minute and add turmeric powder and remove from heat. Stir in wet poha, fried peanuts and salt. Mix everything thoroughly with a wide spatula. Stir in lemon juices and adjust seasonings if necessary. Leave the lemony powdered poha covered for couple of hours if time permits. Serve lemonypowdered poha with plain yogurt and with any pickle of your choice. Notes: Make sure to add just enough water to the powdered poha. Suggestions: If poha powder becomes too wet, let it dry for couple of minutes before adding to pan. If poha powder is dry, sprinkle more water to wet it. Variations: You can also add sliced onion along with green chiles. Other Names: Lemony Powdered Poha. Freshly sliced lemon is squeezed and mixed with honey and water. Adjust lemon juice and honey according to preference. 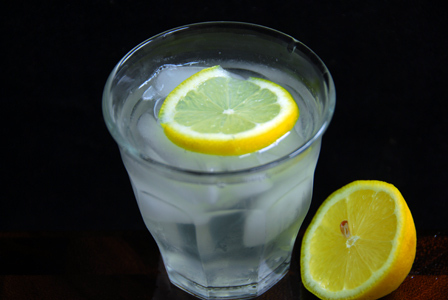 Chill the lemon honey water or add ice cubes to it and serve as a thirst quencher. Makes: around 2 Servings of Lemon Honey Water. Microwave lemon for 5 – 10 seconds to soften it if necessary. Chop the lemon into thin slices for garnish. Squeeze lemon juice out of the lemon (around 2 1/2 Tbsps). Mix the honey with the lemon juice. Stir in 2 glasses of water and then ice cubes into the honey lemon mixture. Garnish with lemon slice and serve lemon honey water immediately. Notes: Make sure not to over squeeze the lemon. Suggestions: Adjust honey and lemon juice according to taste. Variations: Check other variations of beverages here. Other Names: Lemon Honey Water, Nimmakaya Tene Niru.